If you’re looking for ways to revamp your home before the busy holiday season hits, a quick interior painting job can be a simple and effective solution. Homeowners are often surprised at how festive and beautiful their home can look by applying just a few coats of new paint to surfaces inside their home. The following interior painting ideas for the holidays will help you revive your home quickly and amaze your guests during the holiday season and all throughout the year. Warm shades of yellow, green, or beige. Using these colors on your walls or trim will warm up your space and complement holiday decorations. They also play off of spring colors and the summer sun, so you and your guests can enjoy them at any time of year. Creamy neutrals like winter white, taupe, or silver-gray. These colors are sure to brighten up your home and serve as a beautiful backdrop for your holiday tree, pine cones, or silver and gold decorations. Neutral colors will also look great well into the new year. Reds and greens. While red and green are traditional holiday colors for some people, they can also look beautiful in your home after the holiday season ends. Instead of choosing primary shades, think about painting your walls a brown-berry red or a blue-green to accentuate your holiday decor and keep your space looking fresh all year round. If you don’t have the time for interior painters to paint your entire home this holiday season, painting accent walls in one room or multiple rooms can make your home feel more festive and brighter. The beauty of painting accent walls for the holidays is that it can quickly liven up a room while also giving you the ability to add the same color to your room’s additional walls when you have more time later on. A festive accent wall can be ideal when you need a pop of color in a larger room, guest room, or family room. Paint your walls before you select your holiday decorations. Painting your walls prior to choosing your holiday decor will allow you to match up a paint color with the room’s furniture. This will help you decide on holiday decor that will complement both your paint color and overall design aesthetic. If you have already chosen holiday decorations, keep their colors in mind when choosing a paint color. Neutrals like greige, slate gray, white, and even pale-yellow work well with most holiday decorations and can look beautiful all throughout the year. Get help from an expert in-home paint color consultant. When you hire professional painters for your interior painting project, they will send an expert paint color consultant to your home to help you select the paint colors that will work well with your furniture and holiday decorations. They can even help you develop a more cohesive color palette so that your new paint colors flow room to room. 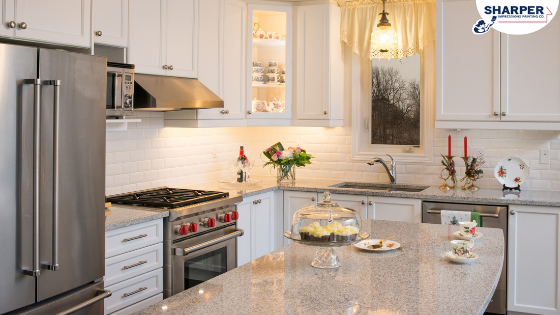 For a striking contrast against festive red walls or slate gray, consider painting your cabinets white. If you need help opening up a small kitchen or bathroom space, paint your cabinets white or light gray. Try painting your cabinets black if your space receives an abundance of natural light or if you have white subway tile backsplash. Paint cabinets greige if you need to add a hint of warmth to your kitchen or bathroom. If you want to add subtle contrast to lighter walls, a darker gray can do the job. If you want the natural wood grain of your cabinets to show through, a soft gray will allow the wood grain to peek through for a more natural but updated look. Consider bolder or brighter colors on your cabinets if you have neutral walls. Think about painting your cabinets in pastel hues for a relaxing or breezy ambiance. Everyone seems to be on a time crunch during the holiday season. This is why it’s important to paint the spaces of your home that actually matter to guests. If you know that your family and friends will be spending most of their time in the family room or finished basement, then you may only want to paint those spaces. Or if you’re expecting overnight guests, painting an accent wall in your guest bedroom can be a nice touch. And if you’re hosting a holiday dinner, the dining room may need a more significant paint refresh. Concentrating on the rooms where your guests will spend the most time will also give you the most return on your investment. Adding fresh paint colors to your home interior can quickly beautify your home so you can focus on finishing your holiday preparations. At Sharper Impressions, our professional painters can help you with all of your holiday painting needs. You can count on us to provide you a quick and accurate interior painting job to give your home a festive update that will look great all year round. Get a free interior painting quote today!